Marks & Spencer is a British retail chain specialising in clothing and food. 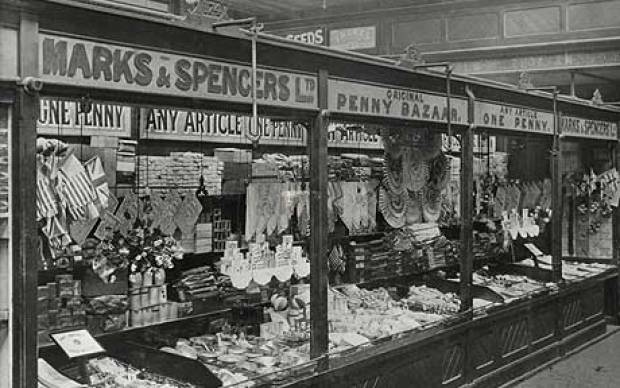 Marks & Spencer’s origins date to 1884, when Michael Marks, a Russian-Jewish immigrant, set up a “Penny Bazaar” in the Kirkgate open market in Leeds, Yorkshire. Marks sold haberdashery goods, and no item cost more than one penny. Marks soon opened a stall in Leeds’ covered market, which was open seven days a week. Outlets were soon opened in the booming cotton towns, such as Warrington, Birkenhead and Wigan. The steady expansion of the business saw Marks recruit Thomas Spencer, a cashier, as a partner in 1894. By 1901 there were 12 shops and 24 stalls in covered markets. In 1903 Spencer retired, and Marks & Spencer became a limited liability company. Marks died in 1907, and his son Simon took over the business, which now boasted over 60 retail outlets. In the 1920s, Simon Marks noted the rapid growth of the low-price Woolworth chain. In 1924 he undertook a fact-finding mission to the US. What he learned there was to revolutionise the business. Marks cut out the wholesaler, and decided to deal directly with manufacturers. On the basis that it was the merchant rather than the manufacturer who knew the customer best, Marks & Spencer would design its own clothing and goods, and then find a contractor who could produce to the specifications and cost. The First World War put an end to the penny pricing system, but in 1924 a new 5 shilling price-ceiling was introduced. By 1926, Marks & Spencer had 125 stores, and floated on the stock exchange to fund further expansion. That year, Marks was joined by his brother-in-law, Israel Sieff, as joint managing director. By 1935 Marks & Spencer employed 11,555 people, placing it as the 55th largest employer in Britain. Opening new stores, and the redevelopment of existing stores, allowed Marks to reposition the company from a working class market to a classless one. By the mid 1930s, M&S had repositioned itself so that Woolworth was no longer a competitor. Symbolically, a state-of-the-art outlet was opened on Oxford Street, London, in 1938. The company began to concentrate on clothing, which accounted for two thirds of sales by the 1930s. By 1938, 80 percent of sales were of clothing, and 20 percent were in food. The company began to position itself inbetween the value stores and the department stores. By 1939 the company was able to boast that 92 percent of its goods were manufactured in Britain.